1. Useful resource & archived material ( links above & in left margin). Mar 2012 Live below the Line- Can you live off £1 a day for food for 5 days? Oct 2011 How Good is insulating your loft? July 2011 Church goes Wild - Lichens event at Hurst Green Church near Clitheroe. June 2011 Bishop Nick walks up Pen y Ghent to visit his Bradford diocese - and some of the flowers seen en route. Jan 2011 Comment on: "Food production needs to double by 2030 / 2050 in order to feed the world. " Oct 2010 Why does CEL care about the environment? One Answer. 2. Editorial: Fossil Fools or Subversive Fools? June 2010 Have a green summer! Nov 2009 Copenhagen - Deal or No Deal? In due course the web pages will be changed to match the new logo. See Hymns and Street Lights - Even here, the pages are still being developed - Comments welcome. 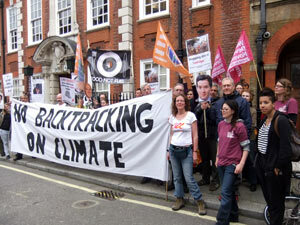 Jan 2008 CEL delivers symbols to 10 Downing Street -press release and report on day. Dec 2007 How to make a CEL display portable hanging leaflet holder or buy a very cheap counter stand. Oct 2007 Europe Women - Fourth Ecology Summer School 2007 . Sept 2007 Cath bishops at UK Parliament..
Mar 2007 Details of "Storm of Hope" 7 July - CEL to celebrate 25 years. 14 Feb CEL Press release: Briefing to Synod on Synod environment Motion. Feb 2005 CEL Press Release on Kyoto and The Cool Church Toolkit. The Tool kit helps churches to calculate their annual contribution to climate change, and take steps to reduce it. David Hallman (of the World Council of Church)'s talk at the above. Apr 2004 The Methodist Church has signed a new energy contract which will provide electricity from renewable sources to Methodist Church House, London. . A cost increase of approximately 10 per cent will be covered by the Church's 'going green' budget. More..
April 2003 Leaflet describing the forthcoming CEL weekend on 30 May - 1 June at Rathmell, North Yorkshire. This is for members and others. Activities will include walks in the countryside, discussions, green Christian Songs, Environment friendly food, a chance to meet others. March 2003 Link added to excellent Prayer and Liturgy material provided as doc file by ECEN for Creation Time 2003. Press Release 25 Feb 03 Energy White Paper "Courageous but built on sand"
Dec 2002 Special 50th edition of Green Christians gives the Christian angle on The World Summit on Sustainable Development. The contents and the Editorial are given on this website. Nov 2002 The Christmas 2002 Issue of ChurchLink can be downloaded now (175kb pdf fle). We invite you to print it out and display it at your church. It contains a Christmas reflection from Archbishop Rowan Williams; a church magazine article on post-Christmas waste; a prayer from CEL's monthly Prayer Diary; and news of a special issue of CEL's magazine Green Christians. Green Christians, CEL's magazine needs new editor. Could it be you? October 18: Church plans to use photovoltaic tiles in church hall roof. 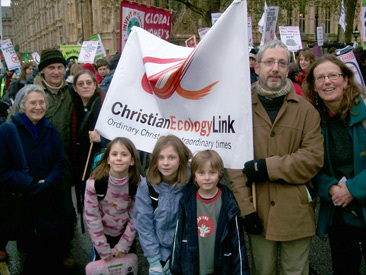 July 2002 A link has been put to the Churches' Earth Summit Briefing paper Please put a link to this briefing from your website too, if you have one. as is Sir John Houghton's talk at the same meeting: Global Warming: a challenge to Christians' lifestyles? CEL's Prayer Guide gives a prayer, or ecological thought or fact for the day each day of the month and is compiled by Philip Clarkson Web. People have been able to subscribe and get the printed prayer diary for several years, but this November we have a trial online and downloadable form of the diary. Introduction and Index to weeks so far put on line The notes are being added in serial form, week by week. November 2000 WCC, CEC, CCEE, ECEN, CTE, EIN, ICC, ACTS, Cytun, Churches Together in Our-Town, : Ecumenical bodies, denominations, local churches and Care of the Environment - A guide to how these organisations and you and your church are related. March 2000 Creation time is the title of the newest web page just created on the CEL website. This describes the resolution at the ECEN conference, that churches should observe the period from September 1st to the second Sunday of October as a period of celebration of the Creator and Creation. Jan 2000 Tourism is the title of the newest web page just created on the CEL website. Find out about air pollution caused by planes, and some of the problems experienced in third world countries.. and first world countries by the development of tourism. Aug 1 1999 Should the Church of England allow trials of genetically modified crops on its land? Dec 5th 1998 The account of the London Churches Conference on the environment at Southwark on 28th November has been added. This has big pictures. Oct 24 1998 The News Page has been added. News will be added to the page as events happen. Oct 15 1998 Pages in four other languages have been provided which can be accessed from the index page: Welsh, German, French and Italian. They are summaries of some of the main activities of CEL. They are not identical. The Welsh page (Cymraeg) is based on our long English introductory leaflet.